Some interesting thoughts about sparrows and bird feeding from one of our young birder members, Coralee Bodeker. Enjoy her essay and illustrations below. It was a cool and dreary morning, but that wasn’t going to stop six young birders and their parents and grandparents from birding Lake Manawa State Park near Council Bluffs as part of our joint field trip with the Omaha Youth Birding Group. The birding started off a bit slow but quickly picked up throughout the morning. After meeting briefly at 8:45 AM to organize, we headed straight for the 772-acre lake that gives Lake Manawa State Park its name. There was a Red-throated Loon spotted at the lake the previous week and we were all anxious to see if the bird was still around (unfortunately, it wasn't). We first scoped the water from a vantage point on the southernmost tip of the lake and were unable to find much of any waterbirds. We did, however, have a handful of Ring-billed Gulls fly over. We knew there was a large raft (a tightly-packed group of ducks or gulls resembling a “raft” on the water) of ducks further up on the lake, so we decided to re-locate for a better look. But, before doing so, we had the unique opportunity to view and learn about American Kestrels up close thanks to Tad Leeper and Linda Dennis from Fontenelle Forest Nature Center and their captive American Kestrels. Both birds are injured and, as a result, are not suited to living in the wild, so they are used for educational purposes. What a neat experience to see these birds up close! Once re-located, we exited our cars in the parking lot and walked toward the lake. A small raptor flew into view and landed in a tree approximately 75 yards from where we were standing. Our immediate reaction was perhaps a Cooper’s or a Sharp-shinned Hawk. Upon closer inspection, we realized it was a Merlin! We quickly set three spotting scopes on the bird and all young birders and their parents and grandparents received great looks of this cooperative bird, which just happened to be dining on a small, unidentified songbird. Even some of the more experienced trip leaders were enjoying the unique close-up of this neat little falcon. This was likely the best bird of the day, and a life bird for many of the young birders. From this point, we also observed Double-crested Cormorants roosting in a distant tree and were able to determine that most of the ducks in the large raft were Gadwall. Next, we relocated to “Boy Scout Island”, a small peninsula on the northern tip of the lake in attempts of again getting a better look at the large group of ducks. Distant looks created a challenge once again, but we received nice looks through the spotting scope at a small group of Ruddy Ducks near the observation platform. Some of the trip leaders explained the identifying characteristics of a Ruddy Duck, including their small body size overall and their stiff tails pointing upward. Our plan was to finish the day viewing the water from the beach near the campground, but we were intercepted by local birder Clem Klaphake who escorted us to a phenomenal spot for sparrows. Harris’s Sparrows were erupting from the brush in incredible numbers, and many of the young birders were able to get quality views of this species. We heard several White-throated Sparrows singing from the brush, and even an uncommon Spotted Towhee emerged for a quick glimpse before going into hiding. One of the young birders, Sam Manning, found a couple of Pine Siskins with a group of American Goldfinches. What an excellent end to a fun trip. Many thanks to Bob Wells and our friends with the Omaha Youth Birding Group for showing us a great time in western Iowa. And as always, thanks to the parents and grandparents for chauffeuring the young birders to Lake Manawa for a Saturday morning of birding with friends. On October 10, 2015, 16 young birders and parents enjoyed a crisp fall morning at Harrier Marsh near Ogden, Iowa. In the midst of fall sparrow migration, our targets were two of the smallest sparrows inhabiting wet grasslands; the Le Conte’s Sparrow and the Nelson’s Sparrow. The wind was starting to pick up, which would make our search more difficult, but excitement filled the air as the young birders anticipated a couple new birds for the life list. As we arrived at the Marsh, we immediately located three Pied-billed Grebes diving on a nearby wetland. We stopped for a quick look before beginning our sparrow hunt. We started down the gravel road that splits the marsh in half and were not seeing much for action, so we decided to venture off road and into the prairie. After about five minutes of walking through the prairie, we flushed a small, light-colored sparrow that immediately dove back into the grasses. Someone called out that they thought it was one of our target species. So, we recruited the help of the parents to help track down the illusive bird and flush it towards the young birders. After several attempts, we still were not able to get good looks at the bird but knew at this point it was a Le Conte’s Sparrow. On the last attempt, parents and young birders slowly crept to the location where the bird was last seen. As we closed in, hoping the bird would pop up, a friendly hunting dog surprised us and came to the assistance. The dog ran to the sparrow spot and flushed the bird. The dapper little orange-faced bird sat in the open for what seemed like an eternity, offering great looks for all the young birders. One of our young birders, Noelle Wagner, was even able to get a stunning photo of the bird (shown in the slideshow). After this experience, we decided it was necessary to recruit an official Iowa Young Birders dog! We continued on our sparrow hunt into the marsh. If there’s one thing we were all reminded of on this trip, it was that looking for fall sparrows is challenging! However, persistence often pays off as in the case of the Le Conte’ Sparrow. Near the edge of one of the wetland basins, a young birder spotted a small bird perched on a blade of grass swaying in the wind. He immediately thought it was a wren, and after some observation and discussion of the characteristics, decided it was a Marsh Wren. This was an exciting find for many of the young birders. We finished our morning walking the property boundary along a grassland and cropland edge. This proved to be an excellent spot for sparrows, and we continued to flush several Song and Swamp Sparrows as well as an occasional Savannah Sparrow. We also observed an American Kestrel hunting the adjacent crop field as well as a couple of Red-tailed Hawks and Turkey Vultures riding high on the wind. After our morning of birding, we met for lunch and discussion of future field trips at the Ogden Public Library. Young birders were provided the opportunity not only to suggest ideas for future field trips, but also to aid in planning the trips they suggested by selecting a time of year and location. The young birders broke out in groups and were given two tasks. The first task was to think of 2-3 themes for future field trips, such as a hawk watch or an owl prowl. The second task was to dream big! In other words, if Iowa Young Birders was to take another long trip, where would you want to go? How fun it was to hear both the creative and important ideas from the young birders! Not only were they suggesting trips to target certain birds, but they were also suggesting trips to improve their identification skills (e.g., ID workshops) and to increase bird conservation and education (e.g., conservation work days). And the “dream big” ideas were very fun! Florida Everglades for Pink Flamingos, Sax Zim Bog for winter owls, and Arizona for hummingbirds and other southwest specialties. However will we choose? A big thanks to the parents for chauffeuring the young birders to this event and to the young birders for their great ideas regarding field trips. The Ogden Public Library was gracious to let us stick around after hours. And lastly, thanks to Noelle Wagner for sharing her photo of the Le Conte’s Sparrow for our slideshow and to Walt Wagner-Hecht for keeping our trip list and notes during our afternoon discussion. Iowa Young Birders was recently featured in an article in the Omaha World-Herald about getting kids interested in birding and bird conservation. You can read the article here. A great essay and drawings by one of our young birder members, Coralee Bodeker, about her experience at her grandparent's cabin. Thanks for sharing Coralee! Hard to believe the fall season is already upon us! Click here to read our September Members and Friends Newsletter. It was a gorgeous fall morning at F.W. Kent Park near Iowa City on September 12, 2015 as 20 young birders and parents joined us for fall migration birding. We started with a brief lesson about passerine migration and learned about the use of weather radar to track migrating birds. The winds were out of the north all night and the bird activity was high, but before hit the trail we had a few presentations to make. Iowa Young Birders partnered with the Iowa Ornithologists’ Union to purchase field guides to give to one young birder on each of our next 12 trips. Aries Bonnichsen was the lucky recipient of a brand new Sibley Guide to Birds, Eastern Region! Lastly, we were lucky to have founder and former Executive Director Carl Bendorf and his wife Linda join us before their move to Colorado, and Iowa Young Birders presented Carl and Linda with a photo book of memories to thank them for starting our great organization. Next, we hit the trail around the Conservation Education Center at the park. We immediately found birds and were able to find a Philadelphia Vireo foraging in the canopy. American Goldfinches were abundant, and a discussion ensued over whether they say “Potato Chip” or “Oh where are the cows?”. Both are helpful in remembering the flight call of our state bird! We walked a bit further down the trail and got great looks at Northern Flickers through the spotting scope, foraging Red-eyed Vireos, and a distant soaring Sharp-shinned Hawk. We also saw and heard a Common Yellowthroat calling from the grasses, and we talked about the similarities in call notes between this species and the Sedge Wren. The birding slowed, and the young birders quickly took advantage of the abundance of frogs at the pond. It’s always fun to see the young birders enjoying all of nature. After walking the trail, we headed toward the nearby bird blind. Here, we observed White-breasted Nuthatches, Northern Cardinals, and a single Eastern Towhee visiting the bird feeders. We finished the morning birding an area near the parking lot that was recently cleared of trees. The area offered a nice edge, and we saw many birds utilizing this edge including a couple American Redstarts, a Gray Catbird, and a Scarlet Tanager. Many thanks to volunteer leader and board member Bill Scheible for sharing his birding knowledge and to Walt Wagner-Hecht for keeping our trip list which can be seen here. On August 29, 2015, two young birders and their parents joined us for a morning of birding in a southeast Iowa migrant hotspot, Shimek State Forest. Shimek State Forest is named after Iowa botanist and conservationist Bohumil Shimek and is one of Iowa's largest state forests. After a brief history lesson, we noticed a relatively large, sparrow-like bird on the power line. We quickly reached for binoculars and noticed a distinct facial pattern - a Lark Sparrow! This was life bird for one of the young birders. Excitement abounding, we started down a logging road in the Donnellson Unit known as a good spot for migrant songbirds. Despite the rather warm and balmy temperatures, we were quickly greeted with bird activity. The chickadees were announcing their presence, and with them was a small flock of migrant warblers. Young birders were able to get great looks at a Canada Warbler foraging low in the trees, a unique experience. Shortly after, we heard a sharp "chip" from the other side of the trail. The bird was low in the underbrush and no quicker than we could all wonder what it was, a vibrant yellow bird appeared close. "Kentucky Warber! 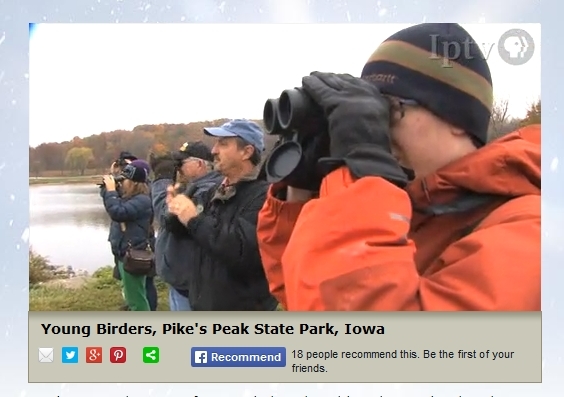 ", exclaimed Carl and Tyler, only to be corrected by the keen eyes and sharp skills of the young birders. The bird was actually a Hooded Warbler, the young birders quickly spotting the black "hood". This was a great experience not only because this was a life bird for both young birders, but because the young birders corrected the "old guys"! We continued down the road but bird activity quickly slowed. However, we were able to add Black-and-white Warbler, Tennessee Warbler, Blackburnian Warbler, and American Redstart to our list as well as a Scarlet Tanager. After about an hour of birding at Shimek State Forest, we were joined by Paul Skrade, a regular volunteer trip leader. Paul asked about the regular Bewick's Wren at the nearby Argyle junkyard, so we all decided to head over and attempt to locate the bird. Standing on the side of the road, we looked and listened carefully for the bird but could not find it. However, a flyover Red-shouldered Hawk was a nice consolation. We finished the trip in the Croton Unit of Shimek State Forest, another known location for migrant songbirds and breeding White-eyed Vireos. At this point, the birding had slowed considerably but we did hear two singing Carolina Wrens in the distance. We encountered birders on a field trip as part of the Iowa Ornithologists’ Union Fall Meeting and exchanged sightings before calling it a day. It was a cool and misty morning on June 13, 2015 as 11 young birders, parents, grandparents, and volunteers gathered at Yellow River Forest in Allamakee County for our Advanced Breeding Bird Workshop. Families drove up to 300 miles round trip for this exciting day. Dr. Paul Skrade, avian ecologist and our local guide, was tasked with showing our group a Cerulean Warbler, and he did not disappoint. In the words of one of our regular young birder attendees (who has attended 33 of our 41 trips), this was one of Iowa Young Birders' best trips! Enjoy a photo slideshow from our trip. Click on the lower right "View original image" to see a larger version of the photo and caption. We started the day with Dr. Skrade introducing us to the Cerulean Warbler, sharing with us information about its biology and habitat requirements. The Cerulean Warbler is a species of conservation concern in Iowa and he is currently working with other researchers to estimate breeding population numbers and habitat associations of this species in northeast Iowa. Attendees asked great questions of our local expert, and as if it was a signal to start birding, a Pileated Woodpecker called from a nearby stand of pines. We started by hiking a wooded trail from the forest headquarters. The habitat was great, and we immediately heard singing Acadian Flycatchers and, after a bit of hiking, a singing Cerulean Warbler. Despite our efforts in searching and waiting for a good look of this little blue-and-white beauty, this Cerulean would not oblige. However, a few Eastern Towhees and a Wood Thrush provided good looks to many attendees, and a young Barred Owl posed on a snag near the trail to allow us to examine characteristics that suggested this bird was a young of the year. As we returned to the parking lot, we searched for (but never saw) a singing Scarlet Tanager. Excitement abounding from hearing a Cerulean Warbler, we next headed up to the Cedar Ridge Overlook in hopes of getting a good view of a Cerulean Warbler. Almost immediately, a male Cerulean that was singing in the area appeared. This bird was pretty cooperative, and after about 20 minutes of waiting all attendees got great views of the bird. Often times, Cerulean Warblers stay high in the treetops. However, this particular spot had trees growing up from below the overlook and brought the Cerulean down to our level for some great views. Ovenbirds were also singing in the area, and the view from the overlook topped off this amazing experience. After taking a break to eat our lunches, we started down a trail just down the road from the forest headquarters. We immediately paused to listen to a Cerulean singing from high in a cottonwood tree. Suddenly, Dr. Skrade was scanning the canopy when he observed a warbler-sized bird dive into a small nest. Everyone studied the nest trying to determine the proud owner. Was it a Cerulean Warbler? Maybe an American Redstart? Tyler returned to the vehicles to retrieve the scope, and after a few minutes of waiting all young birders were rewarded with a scope view of a male Cerulean Warbler returning with a caterpillar to feed the nest inhabitants. We found a Cerulean Warbler nest! Even the local researchers had yet to find a Cerulean nest, so needless to say we were all very excited. 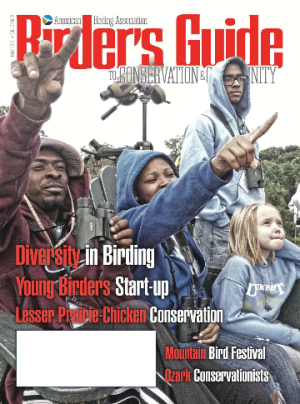 We're very excited that Iowa Young Birders is featured in the latest issue of the American Birding Association's Birder's Guide to Conservation and Community. The ABA has been very supportive of young birder programs across the country. This article: Iowa Young Birders: Story of a Start-Up is a tribute to all the organizations, volunteers, parents, grandparents, and especially the enthusiastic young birders who have made it all possible.